I JUST HAD TO SHARE THIS WEDDING WEEKEND TRAILER FROM STEFANIE AND RONNIE’S WEDDING IN ST. THOMAS. If a picture is worth a thousand words, then this video is everything. 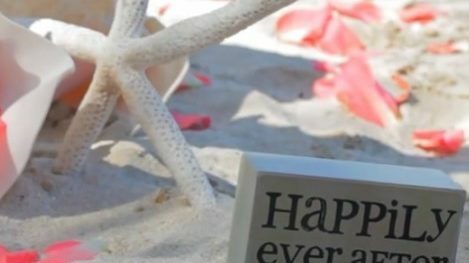 Stephanie and Ronnie brought the amazing Visual Elegance team with them to capture their entire stay on island and created this awesome video that shows everything from the pre-wedding adventures all the way through the wedding activities. This intimate group stayed at Villa del Mar on the north side and chose Magens Bay for the wedding ceremony. The celebration dinner was held aboard a private boat. I normally do not write reviews, but this one was worth it! My husband and I got married on Magen’s Bay in St. Thomas. To give a little history, we had planned a traditional wedding in the states, but do to the overwhelming opinions and complexity…we canceled everything! We had been to St. Thomas for vacation before and absolutely loved it! So, we both decided that’s where we’d get married, on a beach with beautiful water and perfect weather. Little did I know that Blue Sky Ceremony, Amber and Michael, would make it so much more than we both ever imagined! Amber delivered exactly what I hoped for and listened to every request. Being in NC and planning a wedding in the Caribbean ended up being easier and stress-free because of Blue Sky Ceremony. I can’t begin to tell you how genuinely kind hearted and patient both Amber and Michael were through our whole event! She put things together better than I could of done myself! They definitely know the island, the local businesses and the care to make anyone’s day as special as ours was. Even a year later, she sent us loaves of the delicious bread we broke on our wedding day! I would highly recommend Blue Sky Ceremony for anyone looking to have a beautiful, worry-free wedding in St. Thomas. Not only will you have a special occasion, but you’ll leave with new friends who helped arrange it!! We love you both, Amber and Michael! !